Homeschool Science - Fabulous Fridays! Science seems to be either the subject you're excited to teach or the one you're wishing didn't have to be a part of your scope and sequence. I'm in the latter camp, in case you haven't heard me say that so many other times. I think I did the subject justice during our Marvelous Mondays science series, though, with a lot of curriculum that has worked in our home and that you can check out. Since then, we've added two new resources and I'm actually excited to tell you about them. Really! Me! The mom who doesn't like science (I have a workshop MP3 called Science for Moms Who Don't Like Science because I really don't like to teach science). These are not my daughters. These girls have a mother who likes science. The first new addition to our science repertoire is SuperCharged Science, which I recently reviewed for the Homeschool Crew. Supercharged Science was a good fit for us this past spring because Abby (13) is a girl who likes science and I wanted her to have a good underpinning prior to high school science next year. The videos are great, the instruction is thorough, and science done this way is just fun. I became a Supercharged Science affiliate because they are a company I love, and so now I get to give you some freebies! The second addition to our science line-up is the Christian Kids Explore series. No secret that I'm a huge fan of everything Bright Ideas Press produces, but it took me way too long to switch to the Christian Kids curriculum. I recently wrote about the series over on the Bright Ideas Press blog, and I highlighted there what we really like about it. I used the physics book with my 11-year-old 6th grader and 9-year-old 4th grader this past spring. We - all three of us! - really enjoyed it and will finish the book in the fall. So there you go! 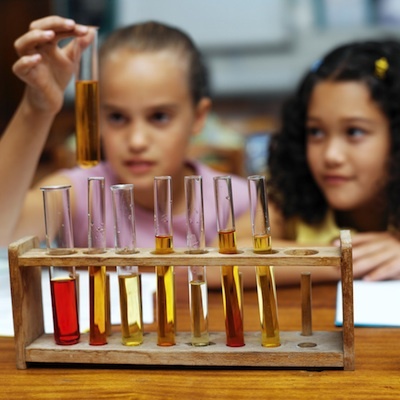 What science curriculum do you love? Now That We've Finished Preschool, What Do We Do? Sign up with your email address to receive every post from Michele and Kendra. Plus, you'll get your own copy of 10 Ways to Delight In Your Children, just for subscribing! We respect your privacy. Period.